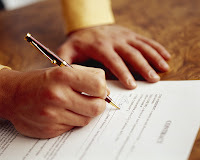 Can an employer seek a court order requiring an employee to sign a non-compete agreement he previously agreed to execute? The answer is, and should be, no. On a couple of different occasions this year, courts have weighed in on a strange issue going more towards contract formation than enforceability. The Second Circuit in a high-profile dispute involving IBM refused to enforce a non-compete against an employee who never manifested his intent to be bound. Earlier this week, I wrote about a bizarre Louisiana case where an employer tried to enforce an agreement against an employee who only signed a non-compete not personally, but only in her capacity as a representative of the employer. Today, it is worth pointing out a Virginia case that deals with a more common scenario, although the facts of this case are a little more unique. In 2003, Mark Lewis resigned from Workflow Solutions, LLC, a nationwide print broker. Lewis apparently resigned under contentious circumstances, and the general allegation appears to be that he engaged in pre-termination solicitation of accounts. Several months later, Lewis and Workflow Solutions reached a settlement agreement whereby he agreed to continue working on an at-will basis for a six-month trial period, after which he could continue if the parties mutually agreed to do so. The agreement specifically contemplated that at the end of the probationary period, Lewis would have to sign a non-compete similar to what he previously signed (and apparently breached). Lewis did continue to work at Workflow Solutions, for several years in fact. But he never signed the non-compete (which was an exhibit to the settlement agreement) and there was no indication the employer pushed him to execute it. When Lewis left to compete in 2008, Workflow Solutions sued to compel him to execute the non-compete contract and have him bound to the same. The court dismissed the case, finding that the allegations could not possibly sustain a claim against Lewis. As a matter of contract construction, the court held that it could not bind Lewis to a contract he never signed. The settlement agreement contemplated that his signature on a new agreement was essential, and the employer simply never demanded it. Under those circumstances, the court was powerless to enforce anything.